Should Google Glass start worrying about its cheaper, superior rival? Despite what you think about it as a product, Google Glass was always going to be hugely influential, and it was never going to be long before competing alternatives began to surface. 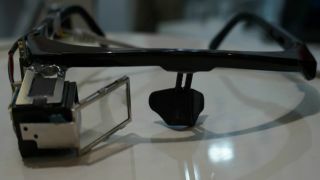 We've already taken a look at a number of the Google Glass alternatives, and the latest to hop aboard the bandwagon is Taiwanese company Oculon Optoelectronics with its own take on Google's eyewear: Oculon Smart Glasses. It might still be in its prototype stages in terms of overall design, but the internals are so far pretty impressive and could threaten to de-face Google's own specs when it arrives. The tested model packed a Cortex-A9 CPU, 720p HD display (although the prototype was working just a 640 x 480 resolution), 5-megapixel camera, bone-conduction speakers and 2,100 mAh battery - which will apparently last longer than Google Glass. It will also have functioning speech and gesture recognition when it launches, alongside some of the more obvious features such as microphone, Wi-Fi and Bluetooth. We don't have specifics on the resolution of Google Glass, but as Google recommends app developers build at 640 x 360, it's unlikely to be as good as what the Oculon is offering. But it's the price point that's really catching our eye right now. At $500 (about £320, AUS $525), the Oculon could slip in as a strong budget contender. The Google Glass Explorer edition (the developer version going out to early adopters right now) costs $1,500 (about £985, AU$1,449), which could be the product's main turn-off. On the other hand, there's no guarantee that the build quality will be great given the cheaper price, so we wouldn't start labeling it the "Google Glass killer" any time soon. But it looks good at least on paper for now. And for those who don't fancy walking around like some sort of sci-fi pirate, Oculon promises that it will also be making a version with screens for both your eyes. Your move, Google.